A Powerbank is a portable rechargeable battery used to charge portable devices via USB port. In most of the cases are used to charge or keep alive modern Smart Phones. Indeed a good Powerbank can recharge every devices equipped with a USB charging port. Electronic cigarettes, Action Camera, E-Book Reader, GPS, Video and Photo Cameras, Drone Battery, Mp3 Player, Games Console and many more. Powerbank is just an ugly name for portable batteries. Batteries, good ones, today can be totally safe if assembled by the book. Beware of very cheap price or "suspect" incredibly high capacity shown out of the box. More in general, do not buy anything under 9EU in Europe. What's the Powerbank maximum capacity? 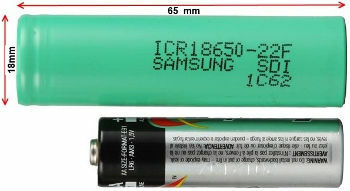 This is the 18650 size compared to a common AA one. The single Cell may have a maximum capacity, theoretically, of 3.400 mAh. Theoretically because a 3.400 one is very very expensive and none use it to assemble a Powerbank, even because aren't easy to bu used in small design, and the efficiency would be so low to make it works like a well done 2.600 mAh. When you read more than 3.000 on a plastic box able to contain one of those cell, it is a useless feature if true, if you read 4000/5000 or more it a scam. With LiPo desing is different, a Polymer one can be cut in the desired and required shape. Polymer ones are commonly used in slim design, just like the Smart Phones internal batteries. Should I base my purchasing on capacity? NO. Capacity is just one, and not mandatorily the most important one, feature. Efficiency, under our point of view matters. In small powerbank design isn't easy to menage a 3000mAh cell in the best way. In fact our ultra portable models equipped with 2.600mAh cell give the same performance of some 3.000mAh sold by competitors, with the not neglectable point we do it much more faster. How can I understand the real capacity? To understand if you purchased the shown capacity use a Smartphone like the iPhone5 as benchmark. A 2.600 mAh powerbank must be able to fully charge it starting from a drained out battery and, possibly, have a bit of remaining power inside. Efficiency, in short, is the percentage of energy I can squeeze out of a powerbank and put it in an external device like a Smart Phone. Below 80% we talk about a not-so-good-rate, below 70% about a really poor one. Let's state you must be able to obtain 2.000mAh from a 2.600 model. This is because the Powerbank itself use some energy to live and to work for you. Why can I charge my iPone5 only once with a 2.600mAh? That's right and it is like that because the efficiency rate. Considering a 80% of efficiency you got around 2.000mAh available to recharge your 1.600mAh battery. But your smartphone will keep consuming energy meanwhile, less or more depending on running applications and services. Plus, part of the energy will be wasted on the "transportation", a good short cable helps. Which certification should I look for? Different countries require different certifications. Some certifications, mandatory in one country could be not required in another one. Our suggestion is to buy only Powerbank using UL certified cells. The UL certification isn't mandatory in Europe but is the only one able to really ensure a high level of safety.